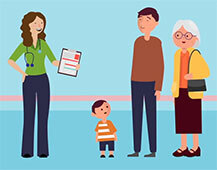 Health and Care Working Together in South Yorkshire and Bassetlaw is a partnership of 25 organisations responsible for the health and care of 1.5 million people living in Barnsley, Bassetlaw, Doncaster, Rotherham and Sheffield. The integrated care system is made up of 18 NHS organisations, six local authorities and key voluntary sector and independent partners. It faces significant health inequalities, with healthy life expectancy differing by more than 20 years across the area. Where deprivation is high, access to services is variable and outcomes can be worse than in other areas. There are higher than average deaths in people aged under 75 from cancer, heart disease and serious mental illness. Levels of childhood poverty are significantly higher than the national average and the gap is widening, and there are more teenage conceptions and mums smoking during pregnancy than average. By working together as an integrated care system, the partners want to better join up GPs and hospitals, physical and mental health and social care to give patients seamless care. Health and care services also want to support people to prevent illness by making different lifestyle choices and keeping a check on their health. In this way, together all partners will support real and long-lasting improvements to the health of local people. Helping everyone to have a great start in life, with support to stay healthy and live longer – improving their chances of having a better education, finding employment and staying employed. The My Best Life project helps the most vulnerable people in society to flourish, with social prescribers putting clients in touch with services that offer support with issues such as isolation or debt. Rob, 57, was referred to My Best Life by his community matron. Rob had been helped medically but he was depressed, lonely, and suffered with anxiety. Watch Darren and Rob talking about My Best Life. Find out more about the changes being made locally to deliver their vision. Find out about the projects that will be happening in 2018/19 to help the integrated care system deliver on its ambitions.